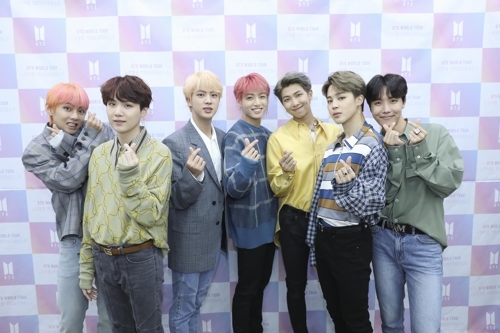 SEOUL, Aug. 26 (Yonhap) — As top K-pop stars BTS bring their “Love Yourself” album series to an end with their fourth and final record under the theme, the boy band wanted to send out the message of carpe diem through the festivities featured in the album’s main track “Idol” and its music video, the septet said Sunday. 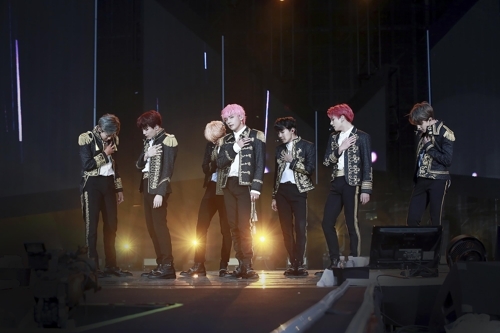 The members defined the overriding theme of “Idol” and their ongoing world concert tour, “Love Yourself,” as “festival” in a news conference held at Seoul Sports Complex ahead of their concert here. The two-day concert from Saturday to Sunday in Seoul marks the beginning of BTS’ world tour, which will take the band to 16 cities in the United States, Canada, Britain, the Netherlands, Germany, France and Japan through February next year. The main single, “Idol,” is a cornucopia of references to BTS’ previous songs, and the song has already proved to be a megahit. 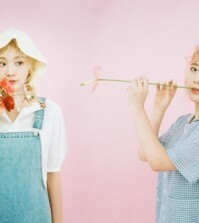 The EDM song and its music video are primarily based on South African beats, unusually adopted elements from traditional Korean music or “gukak” and traditional Korean images like the traditional Korean garment “hanbok” and a Korean pavilion. “It wasn’t that in this album we wanted to demonstrate things Korean because we have done so well so far (in the world),” member Suga said. 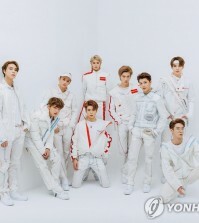 “The feel we wanted to show is that of a festival that brings together people of difference races, sexes, ages,” he said, referring to the music video’s last scene, where a crowd of many different kinds of people join the boy band’s dancing. “This album was produced with a sense that we want to unburden ourselves (of pressure) and play and enjoy with fans like at a party,” Suga said. The two-day-old album has already shown signs of success bigger than that of its predecessor album “Love Yourself: Tear,” which topped the Billboard 200 album chart. Its main track, “Fake Love,” reached 10th on the Billboard Hot 100 song charts. The “Idol” music video broke a YouTube record by garnering more than 56.26 million views within 24 hours of its release, breaking the top record set by Taylor Swift with “Look What You Made Me Do,” which accumulated 43.2 million views in its first day. Asked to pinpoint the reason for their phenomenal success at home and globally, Suga counted the band’s strength in combining social message-packed music with stage performances, while RM cited the members’ single-minded focus on concert performances. “Many people analyze the main reason for our success to be our SNS (communication), but I am sorry about it and can say for sure it’s wrong,” Suga said. The latest album’s festivity theme also plays out in the ongoing BTS world tour, with more room for fans to sing along as well as some interesting role changes among the members. The typically performance-intensive members — Jungkook, J-Hope and Jimin — will demonstrate more of their music sides, while the vocal and rap-focused members — V, RM and Suga — will draw on their performance sides when each of the members stage their solo singles during the world tour, according to the members. “I am one of the performance members. (But this time) I put my focus on rap and live singing, but since performance is my strength, I will have a balance between them,” J-Hope said, referring to his solo performances during the world tour. “We go on another world tour after our previous one eight months ago. 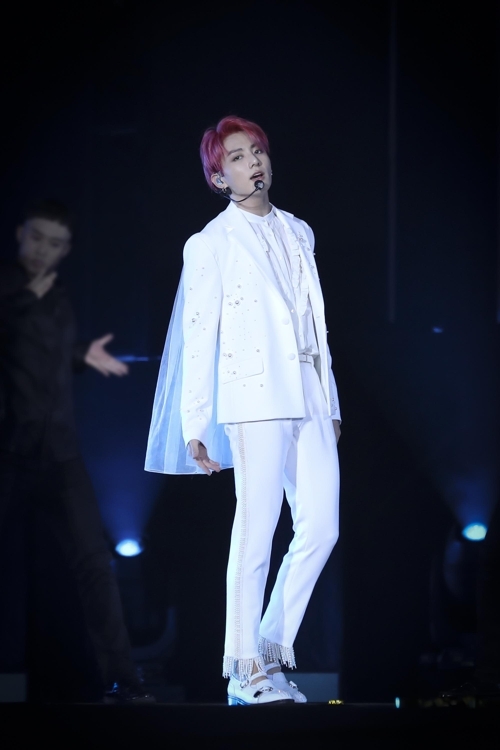 I am pleased and excited at our upcoming meetings with ‘ARMY.’ I hope the fans can return home from our concerts with happiness and pleasure,” Jungkook said, referring to BTS fans. Member Jin alluded to the members’ successful renewal of their contract with their current management agency, Big Hit Entertainment. “We are currently having many discussions among ourselves and with the company and think we can give you good news in the near future,” he said. Wrapping up the much-loved “Love Yourself” series, the members have yet to plan their next project. Personally, RM wants to work on a new subject on how he relates, contributes to and unites with society, he said. “I am not sure whether it is the point the company (Big Hit Entertainment) is also considering (for the next production), but this much I think I can tell you,” RM said.